Norton Storm. In Black Magic. This week I was going to be a Norton Storm Pushchair Review as the pram is a little known brand and there isn’t much information or many reviews about it on the internet. We had it for 12 or so months, bought by my parents as a gift, just before my youngest was born. Planning to take lots of photographs I decided that this week I had better give it a good cleaning to ready it – the last thing anybody wants to look at in a photo is mashed banana! Not a very good selling point if the reader was considering purchasing a similar pram. However, before I could organise myself, it was stolen – from right under the noses of my son’s nursery staff. They were in no way at fault. The pram had been parked in the designated buggy park area in front of the nursery behind a fence. The nursery is on a road that gets a lot of foot traffic, and I guess some awful person spied it as they walked past and thought – ‘that’s a nice pram, I’ll be having that’ and furtively scurrying in behind the fence like a rat (I imagine), stole it. Does a thief think or care of the hurt they inflict when they steal that which does not belong to them? Would they hesitate if they knew that the pram had been a gift from my parents and how upset and angry we all are that such a thing has happened? Unfortunately I think not. All the thief is worried about is making a quick quid and the danger of getting caught. Uncaring about insurance claims (that is if it can be claimed), or the hundreds of pounds that the pram cost – which will have to be forked out again to purchase a replacement – I am sure they would sneer or insult if confronted. I do wonder if they are dumb enough to actually use the pram about our small town. My 5 year old is on constant pram surveillance – having been overawed at the trip to the police station to report its theft. Angry as I was, and upset as I am, all I can do now is say a few words in parting to my lovely pram that I will miss and would recommend. It was a Norton Storm Pushchair in Black Magic. A fantastic looking pram with a light aluminium frame, it had an extending handle (great as I am over 6ft) and a seat that was able to be parent (rear) facing or forward facing. Any pram I have now must be rear facing. The pram we had bought for my eldest had not been, and an incident when a stranger informed me that my baby son was silently choking scared me half to death and I swore I would only have rear facing prams from then on. Such a good idea as at all times baby can see you and you them. Pushchair seat for when baby is older. A smart looking baby bag that cleverly clips onto the front of the pram. 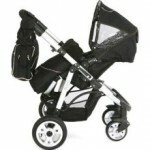 Pushchair with 3 – 7 retails for approx £300 – £350. Complete system (1-7) retails for approx £500 – £550. The reason I went with this pram instead of the iCandy Cherry, which is the other pram I was contemplating purchasing, is the guarantee, which is two years as opposed to the one year on the iCandy. Also, the Norton had sprung front wheels, which the iCandy doesn’t (the springs on the iCandy are for show only). It was also a little more competitively priced – which is always a consideration for most parents. I had been lucky enough to compare the prams side by side at the Earls Court Baby Show which is always a good place to go if you want to see all the leading pram and pushchair manufacturers together under one roof. And you can usually pick up some good deals as well. But back to the pram! There were only two suggestions that I would pass on to the manufacturers. Firstly I found the front wheels to have a mind of their own and had to have them permanently locked in the fixed position. This meant the manoeuvrability of the pushchair was compromised some what. I had to put a neck cushion in the pram to protect my babies head from moving too suddenly as I would ‘hoik’ the pram off its front wheels to be able to change direction. Not ideal but I have found this with most lighter prams/strollers as they don’t have the weight to aid ‘front wheel drive’. Secondly, and this is a minor point, but still annoying. The cosy toe zipped up along its bottom. Making it very difficult to zip it up completely as the side of the pram gets in the way. I would change this to zip up around the top if I were the manufacturers. Much easier for Mum. It is one of the new generation prams built for lightness, so if you’re going to do a lot of off-roading I wouldn’t purchase this pram. And similarly, if you do a lot of travel by public transport then I would consider another pushchair as the Norton folds down in two pieces. The seat has to be detached. Not the ideal situation for travelling on the bus or train, but fine if it’s just going in the back of the car. Would I recommend this pram? Yes I would. It was smart looking, comfortable and light. Would I recommend getting a bicycle lock to secure it? Yes I most definitely would. I miss my Norton. Every time I see the rain cover, or the cosy toes, or use the pram bag around the house I think of it and curse the thief. Please excuse the stock photos – as explained above – too late now to take my own photos! Folded down. Seat must be removed and is not shown. Norton Storm Pushchair. In Black Magic. Black Magic Fabric with coloured piping. 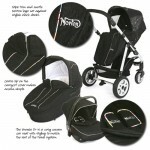 Norton Storm Pushchair. 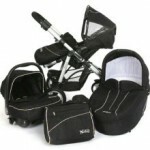 Norton Storm Pushchair with cot, car seat and nappy bag. Subscribe to receive my posts by email and never miss out on a single post. (See Right Hand Menu). This entry was posted in Recommended Product, Review and tagged Black Magic, cherry, Earls Court Baby Show, iCandy, Norton, Norton Storm, Norton Storm Pushchair Review by Mamasim. Bookmark the permalink. Yes, shocking and makes you so angry! I really feel for you.When you lose something it is bad enough, but when something is stolen, I don’t care what the circumstance is, it becomes personal and is a malicious act. To take something that doesn’t belong to you is evil and I just wish more thieves were caught in the act. Using a lock is a way to deter thieves but is not a failsafe, the solution is to get CCTV where things are left that would be attractive to would be thieves. You don;t say where it was stolen from? I hope that your little boy is successful in his surveillance, but make sure you don’t approach anyone, you may be tall but someone that takes what doesn’t belong to them has no scruples! Thanks Sarah. You are so right in all you say. Thanks for all the kind words. I would have to stop myself from giving the thief a piece of my mind if I saw them with my pram though!